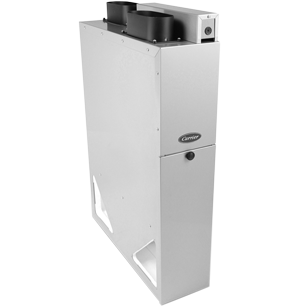 This patent-pending Carrier® Energy Recovery Ventilator (ERV) is designed to mount right onto your furnace or duct. And, like all ERVs, it uses the outgoing air’s thermal energy to pre-condition the air coming in so you can enjoy fresh air without overworking your system. Its unique design simplifies installation by eliminating two of the four ducting paths normally required. It brings in the fresh air and exits the stale year round. This patent-pending Carrier® Energy Recovery Ventilator (ERV) is designed to mount right onto your furnace or duct. It brings in the fresh air and exits the stale year round. And, like all ERVs, it uses the outgoing air’s thermal energy to pre-condition the air coming in so you can enjoy fresh air without overworking your system. It’s designed to be dependable and durable but with your budget in mind. Its unique design simplifies installation by eliminating two of the four ducting paths normally required.